So... I've been in a bit of a creative slump lately. But, I HATE the "life has been busy" excuse more than anything. EVERYONE has a busy life! Anyway... I was shopping in the Costco book section for ideas. I am a kindle reader so I don't buy "books" anymore. mostly intrigued by the darling covers. so whacked that I wouldn't know where to start! I made an exception and WOW! I am glad I did! There are several exercises to do while reading each chapter. A writing assignment, an action assignment, and something to think about for the next 37 days. I have done a few of these assignments. 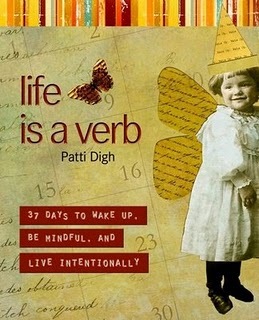 Creative is a verb: If you're alive, You're creative! I have been thinking about SPARK. There is going to be a blogging panel. I really believe that blogging is a way to be creative. actually prioritize a time to blog. I think it will help me get my creative groove on. I am ready for the next 37 days! I will have to read that book. I love a good book when someone has given a rave review. I love that you don't make excuses, but sometimes things are busy and it's overwhelming to keep it all together. You are doing great things. Just so ya know.........I've downloaded the book.